Last week, Wall Street Journal columnist Bret Stephens–who previously gushed over an extremist imam and other Hezbollah-supporting “protesters” in Iran–declared that Iraqis “embrace” democracy more than we Westerners do because they desire freedom more. With their choice of the decidedly un-free Koran and Islamic law as the basis for their laws, Christians being unable to survive there (a Chaldean bishop was kidnapped and murdered by these, um, “democracy lovers”), and the fact that women of all sorts must now wear a hijab and can’t wear short sleeves in public, Stephens’ definition of freedom must be different than how the rest of us define it. But even these facts aside, in Stephens’ rush to declare Shi’ite Muslims who now run Iraq as the greatest Patrick Henrys and Jeffersonian thinkers ever, Stephens missed a few facts. First, there’s that tiny little detail he apparently forgot: that Shi’ites running the elections continued to try and were somewhat successful in forcing out many Sunni candidates and parties from the elections. Perhaps he missed even his own newspaper’s coverage of this inconvenient fact. And then there’s this news we learned over the weekend: that the Shi’ites in Iraq decided to throw out 30% of the ballots cast by mostly Christian (and some Sunni) Iraqis living in the United States–who can’t live in their once native land or that of their parents (the elections allow the kids of at least one Iraqi parent to vote). About 30% of ballots submitted by Iraqi-Americans are being rejected in Arbil, Iraq’s headquarters for the Out-of-Country Voting (OCV) program. 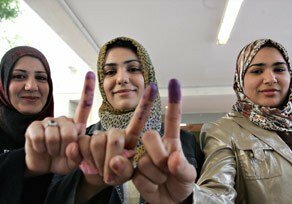 The U.S.-based Iraq Elections marked the third-largest OCV voter turnout worldwide. Arbil is still receiving the U.S. tally by electronic submission from each of the centers, including Detroit, Chicago, San Francisco, San Diego, and Arizona. Center Directors from across America have been directed to throw away ballots for unknown reasons. In the Michigan centers, 2,000 out of 6,100 ballots in the Warren location were rejected by Arbil, and 700 out of the 3,000 ballots in the Dearborn location were also rejected. In Arizona, 600 out of the 2,400 ballots were rejected. In Chicago, 1,100 out of the 3,500 ballots were rejected. All of these locations contain a high number of Iraqi Christian voters. Although Iraq Christians showed two forms of identification before voting, Arbil has not indicated why ballots have been denied. Many of the votes rejected were from Christians, Iraqi’s indigenous population who has been the target of attacks in northern Iraq. The validity of votes from California is still pending word from Arbil. California, by the way, is home to the second largest population of Chaldeans–Iraqi Catholics, who mostly reside in the San Diego area. So, you can bet they didn’t count most of those votes, either. Yup, lets hear it for those “democrats” of Iraq. And don’t forget that everyone in the Middle East–from HAMAS to Hezbollah to the Muslim Brotherhood to the Bin Laden types in Saudi Arabia–loves democracy when they can keep their opposition from both becoming and voting for candidates. A little Islamic Jim Crow is good for all “democracies,” right? Actually, it looks like Stephens is completely wrong about Westerners’ vs. Iraqi Muslims’ love of democracy and who likes it best. I’d say the dead Westerners of Cook County who continue to vote in the afterlife love democratic elections just as much as the live Iraqis who continue to keep Christians and Sunnis mostly out of the process. As much as I despise Joe Biden, his oft-ridiculed idea of splitting Iraq up between Sunnis, Shi’ites, and Kurds sounds much better than the reality of handing the whole country over to Iran-supporting Shi’ites who disenfranchise everyone else. Clearly, he was right (for once in his political life) that these groups simply can’t live together or get along, despite the gushing fantasy otherwise. Sorry, Bret–and we know you read my site when I write about you (since you mentioned it in a previous WSJ column)–your idea about Muslims loving democracy is pure utopian dreaming. They only “love” it, when they are the only participants and the sole winners. I would agree. Iraq without a dictator is simply a pre-modern society consisting of tribal/clan groups and religious sects. There is no civil society to speak of, and politics in such a society is a zero sum game. Saddam was surprisingly frank about this during his reigh. wall street journal is almost as bad as fox news. both owned by the same jerk and both tirelessly trouted out as right wing when thats the farthest thing from the truth. what a joke! Did you actually look at what was posted here, or just spam us with some talking points? Please hang the wallpaper elsewhere, if you do not have anything of substance to contribute. It’s too bad that myriad shots of purple index fingers are now apparently the overriding criteria for democracy for Fox News and the WSJ. Say, if Pelosi would ink her index finger purple would they get onboard with Healthcare too? Thank you for repeating Tyler. Richard Nixon once wrote: “Refuges vote with their feet”. When Saddam Hussein was finally overthrown, the remaining 500 Jews in Iraq were quietly airlifted to Israel. Is there a sane way out of this? BTW: I am glad that Matt Damon’s movie tanked at the box office. Anything that attacks our troops is garbage. 30% absentee ballots thrown away, not bad compared to all the military absentee ballots that were thrown away in the last American Presidential election. Guess they are fast learners from the best government money can buy. In Sweden not only have the persecuted Christian Assyrians from Iraq not been allowed to vote in this election, there are hundreds of them in DANGER of being deported BACK to Iraq! YES! Deported. It seems Sweden has not got room for Christians anymore, JUST moslems. Sweden thinks the Christians are not in enough danger. Now,as od last week, the UNHR has insisted that Sweden allow these Christians ANOTHER chance to APPEAL the deportation and to stay in Sweden because the UNHCR has determined that these folks are indeed in danger IF returned to Iraq. Time will tell what happens in Sweden. So are you conservative idiots finally admitting that the Iraq War was a bad idea??? Who ever said “warfare” is a good idea? I am a conservative but happen to be anti-war due to religious beliefs. I still support the troops and their families by donating to numerous groups like OPERATION SHOEBOX and WOUNDED WARRIOR. We even have soldiers and Marines in the family( they just have a different religion). Nevertheless, YOU have NO right to call any person an idiot unless YOU are one. Got it? If not take a hike. it wasn’t a bad idea you liberal idiot. I’m Iraqi and it’s very great that we got rid of Saddam; however, America should’ve acted differently and took care of the situation differently to make things better instead of worse. Plus, the reason this whole war was launched, something that your liberal head can’t fathom, is to get a strategical spot in the world, close to Iran, close to Israel, close to Saudi Arabia, and the whole middle east. Are those 30% of voters who had their votes thrown out, Iraqi citizens? If so, why is this “democracy” idea failing in Iraq? I know. Islam does not tolerate democracy, it never has, it never will. This is suicide we are comitting by doing this. I hope you realize that. Why the hell would you let somebody from a foreign country vote in your elections? THAT’S COMPLETELY ILLEGAL IN THIS COUNTRY. ONE OF THE REQUIREMENTS (UNDERLINED) in this country is that you have to be a citizen to vote in our country’s elections. Why should they be any different? You know. When the Bush Administration decided the American Constitution was not a good model for Iraq, I knew that it was going to become an Islamic state. I think it was Paul Bremer that decided they would allow religion into the new government(1st Amendment) and he even tried to ban guns(2nd Amendment). Just shows you that the elitists in Wash DC utter disdain for our founding document the Constitution. What a waste of American solders lives and treasure. The founding fathers warned us about nation building. No such thing as democracy, Hamas won elections in 2005 or 6 and they couldnt take office, America screamed for free elections, they didnt like who won, so now its a dictatorship under abbas and bibi.We will have a true democracy in America when we get rid of APAC and all special interest groups. Thats gonna happen real soon. God bless America. People are awake now!!! zionests never predicted the internet or OIL MONEY!!!!!!!!!!!!! Funny how 4 years ago if you didn’t support the Iraq War you weren’t a “real” conservative and now if you DO support the Iraq War you are not a “real” conservative. That is not true. STOP GENERALIZING! US citizens who live outside the USA are allowed to vote. IT IS THEIR RIGHT. PERIOD! Refugees are citizens of their countries and many of them WANT to go HOME if they are safe. Of course they should VOTE!! Not that Stephens was ever a leading intellectual theorist on the Mideast, but these days, I’m sure he’s also aware who has an ever-growing minority stake in the Wall Street Journal and Murdoch publications generally. Part of many conservatives’ fascination with democratic elections may come from their experience with the Communists and Fascists, who of course didn’t allow elections, and we criticized them for that. There can be successful transitions to democracy, and some countries such as Czechoslovakia, Japan and Germany appear to have accomplished such a transition, at least for now. But in order to be successful, preconditions must exist such as homogeneity of the population (something that is rapidly diminishing in the US for what it’s worth), a national commitment to enlightened ideals, and a certain level of economic development. Of course the Palestinians (sic), Egyptians and Iraqis don’t meet these conditions, which shows the problem of applying democracy by rote. Democracy in Europe in the 1920s led to chaos and tragedy. The working classes in Europe after World War I generally had gained the vote, and in many cases voted in Socialist and other leftist groups which had terrible economic consequences (e.g. England Germany and France) helping to create the Great Depression, due to the overextension of economic resources needed to appease these new constituencies; kind of llke what is happening here. But splitting up a country by nationalities can also lead to chaos. Wilson was responsible for granting self-determination to many nationalities after World War I, and this led to complete chaos, and massive resentments that helped fuel World War II. The breakup of Canada into French and English countries would not be a positive step. Sometimes a benign dictatorship may be the best measure on a temporary basis to help achieve a transition from dictatorship to democracy. Iraqi Christians are not wanted in Iraq. They no longer have a place there. They are being killed everyday by muslims. There’s no democracy in Iraq, democracy is moving slower than a slow turtle, and Christians are being killed, no one cares about them, no one protects them.